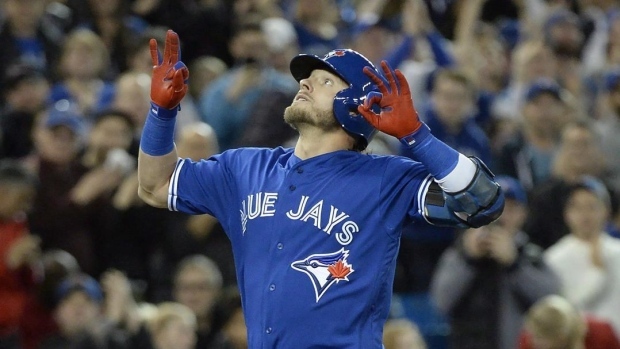 TORONTO — All-star third baseman Josh Donaldson is a step closer to rejoining the Blue Jays. The team said Thursday that Donaldson has flown back to Toronto after spending time rehabilitating his leg at the team's facility in Dunedin, Fla.
Donaldson has been on the 10-day disabled list since May 29 with left calf soreness. Manager John Gibbons said on Wednesday that Donaldson would give the injured calf one last test in full-speed running drills before being declared game-ready. The Blue Jays had Thursday off before opening up a three-game interleague series with the Washington Nationals on Friday. Donaldson has a .234 batting average with five home runs and 16 RBIs in 36 games this season. He has also missed time with numbness in his throwing shoulder. The 2015 American League MVP is a .275 hitter with 179 homers and 544 RBIs.